With numerous gluten-free products available, patients no longer need to feel deprived. They can have their cake and eat it too. As the number of patients who have diabetes, celiac disease, gluten intolerance, and dermatitis herpetiformis increases, so too does the need for RDs to help educate them on ways to incorporate alternative whole grains into their diets. Patients want to know whether they’ll ever be able to eat breakfast cereals, pancakes, bread, muffins, cake, and other favorite meals and snacks again. Fortunately, the answer is yes. According to Ashley Koff, RD, author of Mom Energy: A Simple Plan to Live Fully Charged, there are more diagnoses of gluten intolerance today and a growing awareness of the role gluten may play in negatively affecting digestion in several conditions. As such, gluten free has been linked to weight loss, which puts it in the diet category and increases its trendiness for people seeking weight loss options,” Koff says. Multiple types of grain are available in the United States today. Vandana Sheth, RD, CDE, and spokesperson for the American Dietetic Association (ADA), says rice and corn are two well-known gluten-free grains. “Brown rice and whole corn are the healthier versions. Oats can be safe for someone on a gluten-free diet,” Sheth says. However, a small percentage of people can’t tolerate oats and therefore the ADA recommends incorporating oats into a gluten-free diet under the supervision of a physician or an RD. • Amaranth is an ancient grain rich in protein, calcium, iron, magnesium, phosphorus, and potassium. It’s the only grain documented to contain vitamin C.
• Buckwheat is technically not a grain; it’s a fruit seed related to rhubarb and sorrel. It’s rich in the antioxidant rutin and a good source of fiber, manganese, magnesium, and the amino acid tryptophan. • Corn contains the highest level of antioxidants of any grain or vegetable—almost twice the antioxidant activity of apples. It’s especially rich in carotenoids, particularly lutein and zeaxanthin, and important for eye health. Corn is a good source of vitamins B1, B5 (pantothenic acid), and C; folate; and phosphorus. One cup of cooked yellow corn provides 5 g of protein. Cornmeal is combined with other flour to make baked products such as pancakes, tortillas, and cornbread. • Millet, also an ancient grain, is rich in the minerals manganese, magnesium, and phosphorous and the amino acid tryptophan. One cup of cooked millet contains about 8 g of protein. • Montina is flour that’s milled from Indian ricegrass (unrelated to traditional rice). It’s rich in protein, carbohydrates, and fiber and is used as an additive to primary gluten-free flours. • Quinoa is an ancient grain that’s gaining popularity and often is used in place of traditional starches, such as pasta, rice, couscous, and cereals. Quinoa is rich in amino acids, especially tryptophan. It’s also rich in the minerals manganese, magnesium, iron, copper, and phosphorous. • Rice is a cereal grain familiar to most Americans. Brown rice contains the bran and germ portion of the kernel and is thus higher in fiber. Rice is rich in carbohydrates and protein and contains B vitamins, especially thiamin, riboflavin, niacin, pantothenic acid, and vitamin B6, and the minerals calcium, iron, magnesium, manganese, phosphorous, potassium, and zinc. Rice flour is commonly used for baking gluten-free products, although to improve the flavor and texture, manufacturers often blend it with other flours. • Sorghum is an ancient milletlike cereal grain also known as milo. • Teff is a fine ancient grain, similar in size to poppy seeds. Color varies from ivory, light tan to deep brown, or dark reddish brown purple, depending on the variety. Teff has a nutty, molasseslike sweetness and is somewhat mucilaginous (gelatinlike). It’s eaten uncooked, as a cooked grain, or ground and added as part of the flour used in recipes. Teff is rich in carbohydrates, fiber, and protein and contains all eight indispensable amino acids, making it a high-quality protein. It’s chock-full of thiamin and contains significant amounts of the minerals phosphorus, magnesium, aluminum, iron, copper, zinc, boron, and barium. • Wild rice is an aquatic cereal grain that grows wild in isolated lakes and riverbeds in the cold regions of North America. It’s brimming with carbohydrates and fiber, protein, and the amino acid lysine. It contains the minerals phosphorous, potassium, and magnesium and the B vitamins thiamine, riboflavin, niacin, and folic acid. However, it’s important for consumers to pay attention to food labels. Sheth says patients on alternative grain diets need to identify whether they’re actually getting the whole grain or the grain flour. They need to determine where the ancient grain is listed on the label. Patients also must know that ingredients on labels are listed from the largest amount to the smallest amounts. For example, they need to determine whether a whole grain is listed way at the bottom of a long list of ingredients or if it’s listed at the top. Jules Shepard, author of The First Year: Celiac Disease and Living Gluten-Free, says it’s easier to make homemade foods taste the same as using a wheat flour-based recipe by substituting a high-quality, high-performing all-purpose gluten-free flour then adding nutrition-dense whole grains for balance. Many patients who are restricted to eating only alternative whole grains may believe they’ll never be able to eat like a normal person again. But this is not the case. Koff always explains to her clients who’ve been diagnosed as gluten sensitive or gluten intolerant that the most healthful diet for everyone is to eat whole foods in the state closest to the way they exist in nature. Sheth recognizes that identifying gaps in the diet created by dietary restrictions and filling those gaps can be challenging but achievable. “Providing meal and snack ideas, and recipes that include ‘safe’ products can help patients gradually adapt and, in fact, make eating adventurous and exciting,” Sheth says. 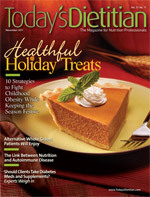 The ADA has several resources available, including Easy Gluten-Free: Expert Nutrition Advice With More Than 100 Recipes by Tricia Thompson, MS, RD, and Marlisa Brown, MS, RD, CDE, CDN, and the ADA Pocket Guide to Gluten-Free Strategies for Clients With Multiple Diet Restrictions by Thompson. Both of these resources are valuable for all RDs, especially those who work with patients who have gluten-free dietary restrictions. Because many of our traditional foods either inherently contain gluten or are exposed to it during the manufacturing process, many gluten-free products have become available in stores and online for those who must eat them. Michele Macedonio, MS, RD, CSSD, LD, director at Sports Dietetics-USA, says she informs her gluten-intolerant clients about a new program available at GFreeConnect.com, through which people can receive a care package four times per year and sample products before they buy. Through a modest subscription fee, members receive a care package every three months with more than $120 worth of gluten-free products to sample, plus coupons and educational materials. GFreeConnect offers a smart way for clients to taste before they buy and to see what new products are available. For a wide variety of high-quality, gluten-free meals, snacks, and ingredients from which to choose, the following is a list of manufacturers and websites you can tell patients about.